Batman Fanshop - Batman Classic: Gothams Villains Unleashed! Batman Classic: Gothams Villains Unleashed! In "Batman: Gotham's Villains Unleashed!" the Joker breaks out all of the villains in Gotham's Arkham Asylum. It is up to Batman and Robin to stop them and protect the city! Cayden: "There were lots of bad guys in this book. The Scarecrow was super scary! 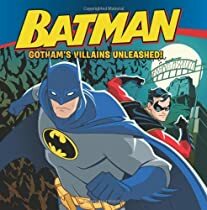 My favorite part was when Batman got in his Batmobile and Robin got on his Batcycle and then they went after all of the bad guys. I liked when they were in the place with all of the mirrors and the Joker was trying to trick Batman. " "Batman: Gotham's Villains Unleashed!" by John Sazaklis is definitely an action-packed book. There are many, many villains like The Penguin, Two-Face, Poison Ivy, and Mr. Freeze. Don't worry if you don't know who they are (like I didn't) because there is a handy guide with each villain's picture and a brief biography. This is a great book for any little boy who loves Super Heroes! 4 year old boy AND girl twins LOVE this book! Both of my kids, a boy and a girl, 4 years old, cannot get enough of this book! Graphics are great and it's just cool enough -- but not too scary -- for them to think they are really into the bigger kid super hero action stuff. Would highly recommend it. Off to search Amazon for others in the series now! Holy Comic Book Wonder! My grandsons aged 4 and 5 can't get enough of this book. They are mini-super heroes in the making. Eyes wide with wonder and excitment as these are being read by whoever will oblige them. Great story and terrifically illustrated.